24-hour forecast: Cloudy spells with a few showers or periods of rain in the south and along some coastal areas today, becoming isolated tonight. 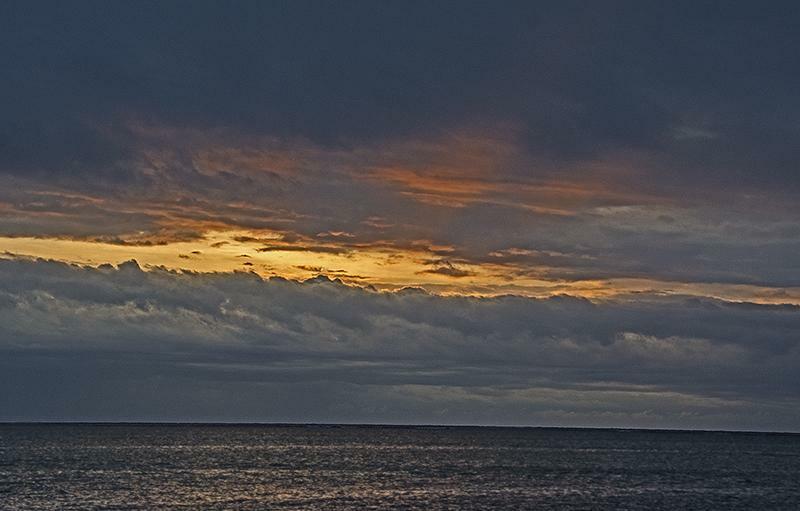 Today: Winds: N/NE 5-15 kt ; seas: Light chop-choppy ; waves: 1-3 ft ; a few showers or periods of light rain. Tomorrow: Winds: Variable at 5-10kt; seas: Slight; waves: 1ft; mostly dry. Marine Outlook: Winds: Variable at 5-10kt; seas: Slight; waves: 1ft; mostly dry. It's cloudy and cool on Ambergris Caye this morning. Heavy overcast sky with a Northern breeze and calm sea. Our expected high is 82. 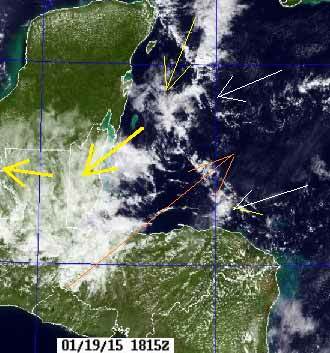 Looks like this overcast or elevated fog will be covering much of Belize for sometime. . . ..With high level Pacific SW winds keeping the cloud cover for longer in the day. . . . There are patches through it. . ....The ight time "Tiger" wind is sill blowing from the Guatamalan mountains this morning. With Overcast skies, it is hard to see which way the clouds are moving, but it does look as if the northerlies we had on Saturday, are now back round to NE or even ENE..... I have seen small patches through the overcast and the sun is getting through brighter. As you can see, there are 3 winds effecting Belize.. . . The "Tiger" wind from Guatamala now having stopped. . . The low level Caribbean wind proper, is coming in from the ENE. . .. But a mid level wind with cloud still coming down from the NNE. . . This is actually swinging round,so crossing Belize from the NE and going into Guatamala due easterly. . . . . 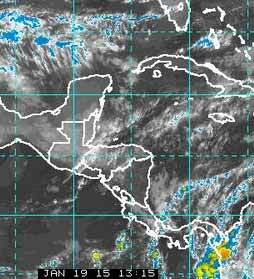 The high level Pacific winds, crossing from the SW and contributing to the cloud formation over Belize.